Albemarle County Sheriff J.E. 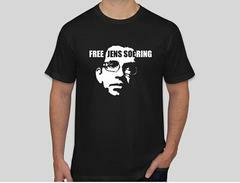 “Chip” Harding is supporting a bid for freedom for Jens Soering, a German national convicted of the 1985 murders of his girlfriend’s parents in Bedford County. And a new report from an expert requested by Soering’s lawyer questions the work done by the Virginia Department of Forensic Science in 2009, which subjected evidence recovered from the bloody crime scene to DNA testing not available at the time of the murders. 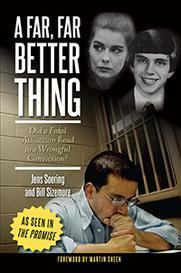 In a case that has generated national and international attention for decades — recently a German film and an American book — Soering has a pardon request pending before Gov. Terry McAuliffe based in part on the DNA test results. Soering was convicted of the murders of Derek and Nancy Haysom at the behest of their daughter — his girlfriend and fellow University of Virginia scholarship student Elizabeth Haysom. Both were convicted of the murders. Soering initially confessed but later said he did so falsely to protect Haysom. The governor’s office confirmed there is a pending pardon request but would not comment further. In 2009, DNA testing by the Virginia Department of Forensic Science identified DNA profiles in 11 items recovered inside the Haysoms’ house but failed to find Soering’s or Elizabeth Haysom’s DNA. Then last year, Soering and his lawyer, Steven Rosenfield of Charlottesville, announced that two of the items that yielded DNA results were Type O blood stains. Soering has Type O blood, but the three Haysoms do not. The prosecutor argued to the jury during the trial that the Type O blood at the scene was evidence Soering was the killer. Rosenfield and Soering said last year that the 2009 test results meant the only way Soering was guilty was if he had a male accomplice with Type O blood, an accomplice Soering has inexplicably protected for decades. Betty Layne DesPortes, a Richmond lawyer and president of the American Academy of Forensic Sciences, told the Richmond Times-Dispatch last year that since one person cannot have two different blood types, the Department of Forensic Science results indicated something was amiss, possibly contamination. However, a report dated Monday by Moses Schanfield, a DNA expert on the faculty at George Washington University, concludes that the state report was misleading and that there was not enough information to say the DNA from the two different blood types came from the same person. Schanfield’s report also criticized what he said was a Sept. 15, 2016, memo from the Department of Forensic Science that he says suggests the blood-typing done by the forensic laboratory in 1985 may be erroneous because there was not enough blood to work with. He contends, “This one statement alone indicates a confirmation bias by the DFS laboratory.” The blood typing results for at least one of the Type O stains is “indisputable,” he concluded. Schanfield added that DesPortes did not have the benefit of the department’s laboratory records, which he reviewed when stating that the DNA profile identified in the Type O blood may have come from a source other than Type O blood. The department said Tuesday that it could not comment on Schanfield’s contentions.